Introducing the Integrity, a 141 ft. luxury yacht customized to carry 16 adventurers in comfort, safety and style. Integrity has been cruising in the Galápagos waters since April, 2005 and last major refit completed in 2018. 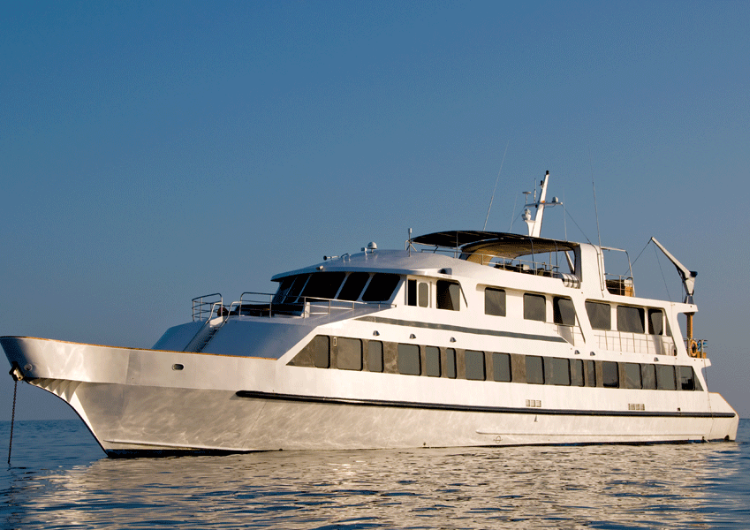 Built in the USA, the Integrity conforms to exacting standards for luxury Galápagos cruising. All systems including engines, transmissions, stabilizers, electronics, water filtration and sterilization systems are state of the art. The decor is refreshed annually. All staterooms are on the main deck and are lower twin, queen or king-bedded. There is a 350 sq. ft. king-bedded owner’s suite and one single stateroom. Each stateroom has large picture windows, individual climate control, satellite telephone, a stocked refrigerator, and an entertainment center with CD/DVD and LCD monitor. Bathroom facilities are en suite with a full-size shower, lavatory and toilet. Meals are served at four tables of six places, not far from a galley designed for gourmet chefs. The comfortable salon is bathed in natural light, perfect for reading or listening to lectures on Galápagos natural history, geology and tomorrow's encounters. A wide-screen media center is hidden behind the painting of undersea life and is available for viewing your day's images as well as for your guide's informative presentations. On the partially covered top deck, you'll find a spa, bar, barbecue and comfortable chaise lounges. It´s a place to relax, enjoy a beverage or snooze in the gentle breezes. With its huge state-of-the-art stabilizers and engine vibration control system, the Integrity will carry you through Darwin's Islands more smoothly than any other yacht.